P is for Parsnips - Family Times is an award-winning magazine with staff-written news, feature stories and artwork that inform and inspire Central New York parents and their children. Chris Xaver, right, and her helper, Lily, zest a lemon, in the photo above left. Above right, Chris slices a parsnip lengthwise. It’s best to remove the woody center of the larger tubers. Parsnips are so sweet, in Roman times they were used as currency. And in Europe they were used as a sweetener before sugar cane came along and took their crown. I love researching a food: It gives me a whole new level of appreciation for it. Let me tell you first my history with them and then I’ll share what I’ve learned. My grandmother, who died decades ago, lived in a senior housing complex in California. As one of the few people there with a car, she was very popular, and she often received thank-you gifts for rides, such as a bag of homegrown food. One of these bags was my introduction to parsnips. When I opened up this bag of veggies and saw what I thought were bleached carrots, Grandma smiled and said, “Oh, no. Better.” And we roasted them. That day they were roasted with rutabaga (my first time having that, too) and a beef roast. I have to admit, I fell in love, despite the rutabagas’ quite unattractive appearance. The taste was just too delicious to deny. So I began including these new vegetables in my repertoire. Our first Thanksgiving was interesting. He made dishes, I made dishes, and we had enough food to serve 60 instead of the 20 folks who joined us at our holiday table. Our second Thanksgiving together, we did better as we’d learned how to blend our families and our tastes. He loves sweet. I’m a savory girl. And the kids, well, they like sweet about 90 percent of the time! But what our kids have learned is to never underestimate me. If I make something for them, it is going to taste great. And if it’s supposed to taste sweet, it will. It’s all about learning how to use sweeteners, whether they are artificial or natural. Stevia has been my “go to” sweetener of late, but I had to learn how to work with it as it tends to get bitter if subjected to high heat. So I cool down dishes before I add stevia. So what about parsnips? The plant is actually a mix of carrot and parsley—the root resembling the carrot and the leaves, parsley. As for the taste: Nutty is the best description. They are sweet like carrots but have more starch. They can be eaten raw, but most of us don’t do that. We roast them or cook them to bring out even more of the sweetness. However, what many of us do is peel them. I try not to peel most of my vegetables, as I believe the flavor and nutrients are in or sometimes just below the surface. Instead, I have a special stiff scrubber I use to thoroughly clean vegetables and leave the peel on. When you choose your parsnips, bigger is not better. Smaller tubes will yield more tender results. Bigger shanks end up woody and stiff. You can use them, but I would quarter them and cut out the woody center. 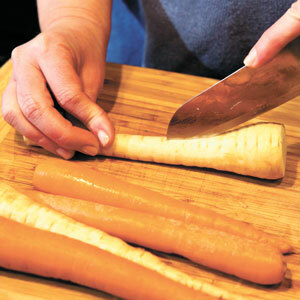 When you cut into a parsnip, you begin the oxidation process, like what happens with apples. The discoloration won’t affect the taste, but isn’t as pretty. The way to stop that is the same as with apples: a bowl of ice water with a bit of lemon juice. A still easier and tastier option is to simply go for a younger, smaller, tuber that doesn’t need cutting. The color should be a creamy off-white. Try to avoid those with blemishes or those that are shriveled. I’ve got two versions. Which you make depends on your family’s preferences. I make the sweet version for the new husband and kids. Honestly, make both and see; they’ll most likely eat both, too! That’s the great thing about the blended family: expanding palates as well as our Thanksgiving table. 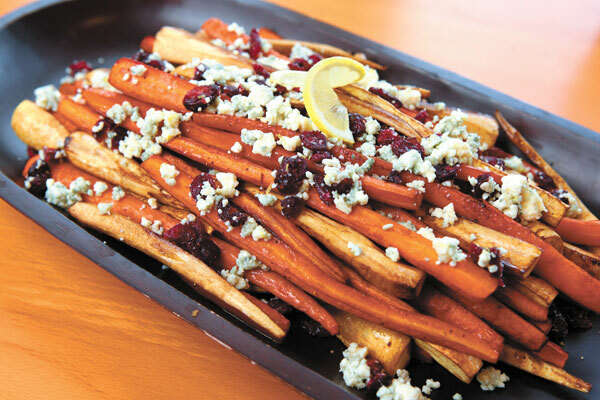 For the Spiced-Up Savory Parsnips & Carrots dish, above, add the cheese mixture after cooling the roasted vegetables for 15 minutes or so. Chris Xaver, Ph.D., is a newly re-married local TV and radio personality with a blended family consisting of five children ranging in age from teens to adults. Heat the oven to 400 degrees. Whisk your olive oil with the vinegar. Add the maple syrup. (Don’t put the stevia in now, as it gets bitter with high heat.) Toss the tubers with the oil and vinegar mix and lay flat on a jelly roll (or similar) pan. For easy cleanup, line with foil. Season evenly with salt and pepper. You may need to use two pans and rotate during roasting, as you want an even layer, not too crowded or they will steam rather than roast. Roast 30 to 45 minutes, until tender. Toss them every 20 minutes or so, so none of them gets too brown. Meanwhile, toss together the rest of your ingredients: lemon zest, red pepper flakes, stevia, the cheese and the berries. Remove from the oven and allow to cool somewhat. After about 15 minutes, evenly sprinkle the cheese mixture on top and try to gently combine it without breaking up the cheese or the tubers. Heat the oven to 400 degrees. Layer the tubers on the jelly roll (or similar) baking sheet. (I line mine with foil.) Coat them with the oil. If you have a spray bottle, now’s the time to use it. Otherwise, use your hands. (This is a great job for the little kids. They just love rubbing oil all over the sticks.) Season with salt and a bit of black pepper (not too much; don’t overwhelm this dish). You may need to use two pans and rotate in the oven during this process. Roast 30 to 45 minutes or until tender. Toss them every 20 minutes or so, so none of them gets too brown. Meantime, in a small saucepan melt the butter. Be very careful because this just takes seconds and butter can scorch quickly. Once melted, whisk in the cinnamon, nutmeg and a pinch of salt. Allow to cool to room temperature. Then, stir in the stevia and the lemon zest. Remove from the oven and allow to cool slightly. After about 15 minutes, toss the sticks with the glaze. Serve on an incredibly beautiful platter!